This book examines the social codes and practices that shape the literary culture of a combined fifth/sixth-grade classroom. It considers how the social and cultural contexts of classroom and community affect four classroom practices involving literature--read aloud, peer-led literature discussions, teacher-led literature discussions, and independent reading--with a focus on how these practices are shaped by discourse and rituals within the classroom and by social codes and cultural norms beyond the classroom. This book's emphasis on intermediate students is particularly important, given the dearth of studies in the field of reading education that focus on readers at the edge of adolescence. "Lewis' ethnography is rigorously developed and well written. She raises many interesting points about how school works for children in predominately middle class settings. Those with related interests will find Lewis' book valuable reading." "Lewis's focus on fifth and sixth graders brings a much needed perspective; those grades too often are neglected in literacy research. Her identification of class (along with perceived ability, age, and gender) as an important factor in classroom dynamics is even more unusual. As Gee points out in his Foreword, Lewis's study 'speaks…in crucial ways to how class works in regard to (children's) affiliation, an issue that has been heretofore badly confounded with race in educational studies'." "By providing a theoretical foundation and a clear glimpse into the realities of the classroom, Lewis enables the reader to meaningfully reflect on common literacy practices, and draw conclusions about how they may be shaped by the power, status, and cultural norms of the classroom." "The book is valuable for literacy education for two reasons. First, it offers the opportunity for readers to consider how literacy practices within the classroom are influenced by social codes and dominant cultural norms outside the classroom….Second, researchers have found that access to books is positively correlated with the amount of reading in which one engages and with reading achievement." 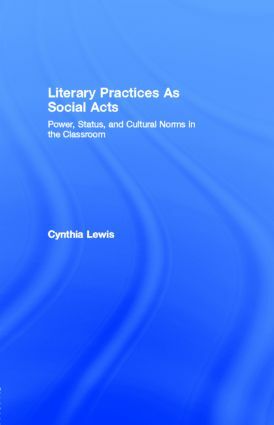 "[Literary Practices as Social Acts provides a useful theoretical framework for understanding how the wider social contexts can help shape both oral and literary practices of second and foreign language classroom communities and, thus, could be of great value to those interested in undertaking similar kinds of research in these classrooms. In addition, the implications provided here offer second and foreign language teachers a lens for conceptualizing, examining and, ultimately, transforming their own classroom practices. Anyone with an interest in second and foreign language learning will find this book worthwhile." "The theoretical framework is well articulated, the portraits of individual learners are engaging, and the practices are described and illustrated with simple yet captivating prose. Even readers unfamiliar with the theoretical stance Lewis takes or with the nature of elementary classrooms will be drawn into the descriptions of the events of this classroom community. Also noteworthy are the details Lewis provides to demonstrate the subtle ways in which individual actions within classrooms are informed by larger sociocultural norms, beliefs, and practices outside of the classroom." "Lewis's book encourages educators to think carefully about the manner in which social codes and conditions may affect the access that students are granted to literacy interactions in the classroom. In so doing, teachers may be better equipped to view the literacy practices of their classrooms and the literacy interactions within those classrooms, through a lens that reflects the broad social experiences and expectations of their students." "This is the next generation of literacy research, with power and politics and identity jumping out of the pages." "This probing and provocative study promises to be a vital addition to the field of research in literacy education…. Educators, researchers, and policymakers alike will be captivated by this book." "Meshes a focus on social context with performance theory to examine the roles, footing, positioning, and dramatistic aspects of classroom interaction….A primary strength is the analysis of the subtle social dynamics of classroom talk about literature that draws on a range of current theory. This analysis should provide teachers with a lens for analyzing their own classrooms, particularly in terms of students' social positioning through language." "At last, a book that explores the subtleties and ideological underpinnings of four common literacy practices in literature-based reading programs: read-alouds, peer-led literature discussions, teacher-led literature discussions, and independent readings. This book will change the way literacy teacher educators think about these practices. Just as importantly, it will provide them with concrete examples of how the social politics of classroom discourse simultaneously shape, and are shaped by, such practices. Cynthia Lewis's solid grounding in classroom pedagogy comes through clearly, particularly in the way she is able to help her readers understand why any idealized notion of classroom community must give way to a more sensitive explanation of the assumptions underlying that concept. In this book, Lewis is at her finest--a teacher scholar and literacy researcher who knows how to tell an engaging story that makes us sit up and take notice." "A careful study of literacy-related social practices and the ways in which they do and do not recruit children's affiliation. It speaks, as well, in crucial ways as to how class works in regard to such affiliation, an issue that has been heretofore badly confounded with race in educational studies. In treating literacy in terms of value-laden social acts, [this book] has the capacity to place the public discussion of literacy back where it belongs." Contents: Preface. Foreword. Part I: Contexts. The Social Politics and Performance of Literature. A Social Geography of the Classroom and Surrounding Community. Part II: Literary Practices. Enacting Classroom Culture Through the Ritual of Read-Aloud: What Do We Have in Common? Negotiating Classroom Culture in Peer-Led Literature Discussions: What Are Our Social Roles? Probing Cultural Norms in Teacher-Led Discussions: Why Do We Believe What We Believe? Appropriating Cultural Norms Through Independent Reading: What Will We Accept, Reject, or Reinvent. Part III: Reflections and Implications for Pedagogy. Literary Practices as Social Acts. Appendix: Methodology.